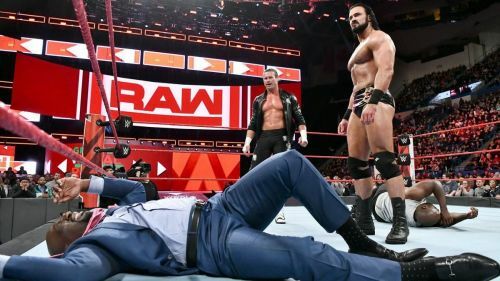 There seemed to be no reason for Dolph Ziggler and Drew McIntyre to team up, but now there seems to be no reason for them to fail. During WWE's 2018 Superstar Shake-Up, Dolph Ziggler made his way back to RAW with some muscle in tow: recently dethroned NXT World Champion Drew McIntyre. The ex-cheerleader and the Scot were met with skepticism at first, but their debut this past week against Titus Worldwide, featuring a spectacular tandem finisher and an even more fiery promo from McIntyre about his new career direction, turned those early guffaws into high expectations. Ziggler has floundered basically since his exceptionally brief World Heavyweight Championship run; since then, his sporadic pushes have never amounted to much of anything, and his pairing with Drew McIntyre seemed more like an exasperated "hands in the air" maneuver by the company than anything else, an admission that they had nothing more for him, so why not form a tag team? Will Ziggler and McIntyre join these teams, whose origins came from similar "we have nothing else for you" circumstances? This won't be Billy Gunn's only appearance on the list, but Billy Gunn has a habit of shining in tag team situations while feeling incomplete in the singles scene. His botched 1999 King of the Ring win led to little more than a Rock squash, and was a simple speed bump between New Age Outlaws breakups and reformations. Chuck Palumbo, meanwhile, was one of the best of a disappointing crop of WCW performers to come over in the lackluster InVasion angle, which is a bit like being the best player on the Cleveland Browns. Palumbo came in paired with Sean O'Haire, and the two found themselves split up in late 2001 and facing repackaging. 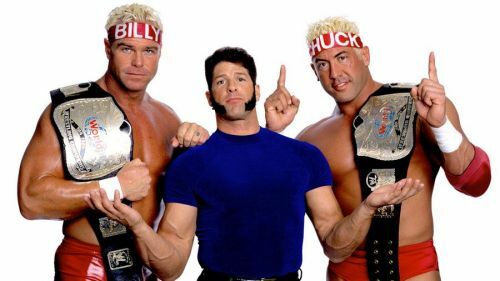 Palumbo and Gunn debuted late that year with matching bright red trunks, headbands, and bleach blonde locks, with constant insinuations that they were more than just tag team partners. Those insinuations only got broader with the addition of Rico to the entourage. The gimmick was a nonstop gay joke, with WWE winking and nudging at the audience about whether or not Gunn and Palumbo were "just" tag team parters; their SmackDown wedding attracted all kinds of mainstream attention for possibly being a step forward in WWE's treatment of the LGBTQ+ community, but turned out to be just another wrestling angle (although one featuring one of the best-executed swerves of Eric Bischoff's career). Regardless, the duo were successful, lasting approximately two years and spending four months of that time with two tag team title reigns; the gimmick may have been low-level comedy, but their wins were no laughing matter.